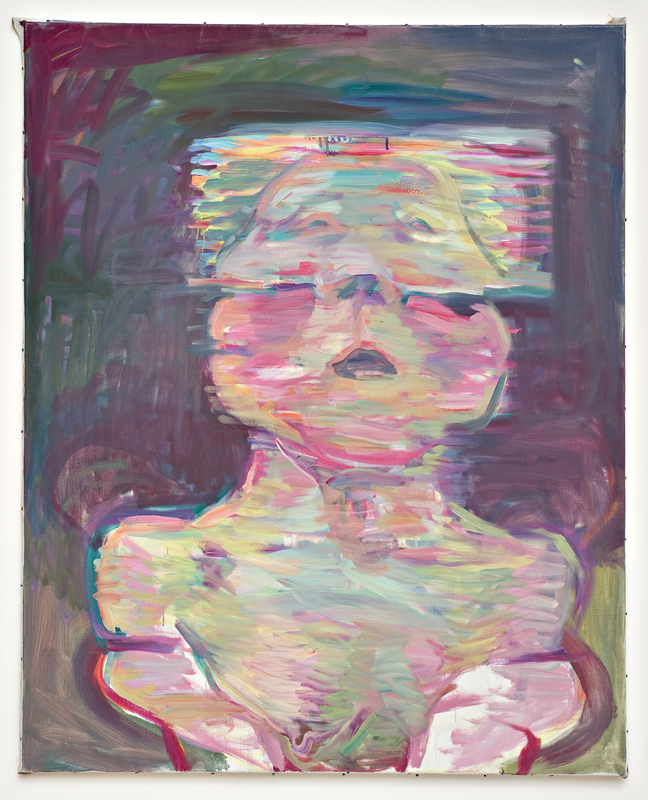 The work of Maria Lassnig is deceptive in its simplicity. Bright, seasick colors and sloping, often pathos-inspiring, self-portraits seem to fade in and out of focus, occasionally giving away to the staunch white of the surrounding canvas. In others, the artist blends cool tones and and an even smoother application to create pieces almost completely vacant in their emotional intensity. But in each work, a powerful subtext can be detected, a self-awareness both vocally present and consistently self-aware in its definition and re-defining of itself. 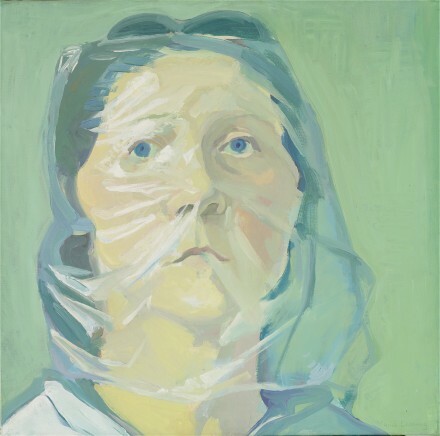 Stuck in a corner of MoMA PS1‘s current career retrospective for the 94 year-old painter, Self-Portrait Under Plastic is a remarkably understated, but perfect example. Its cold, sloping lines converge on Lassnig’s laconic, peaceful visage. Her minimal brushwork; a series of soft, gentle curves and twists in off-white bringing a real sense of transparency and movement to the image. But for all its immediate passivity, the work is charged with a certain raw humor. Stuck somewhere between classic portraiture and a structuralist exercise, breaking her homage to Van Gogh’s smooth portraits with her own flippant dismissal. In other works, like the colorful, high-energy Sciencia, Lassnig embraces her body as the center of a scientific fantasy, strung aloft with wires and screens, and shaped by her intense neon hues. 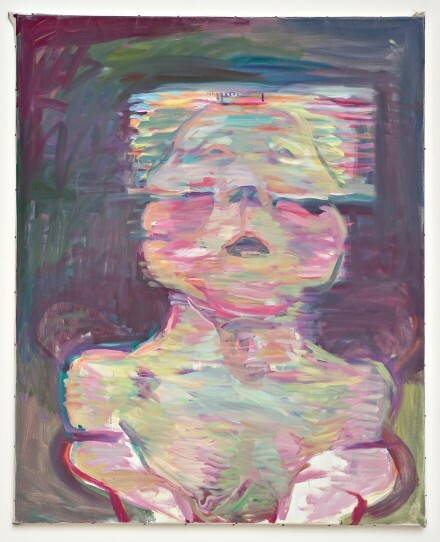 The brightly lit pieces challenge the viewer to translate her works as a horror-inducing dystopia, or an inspired inquiry into new potentials for the body. Minimal in their presentation, the works do a remarkable job of commanding and holding the viewer’s attention, even without extending prompting. 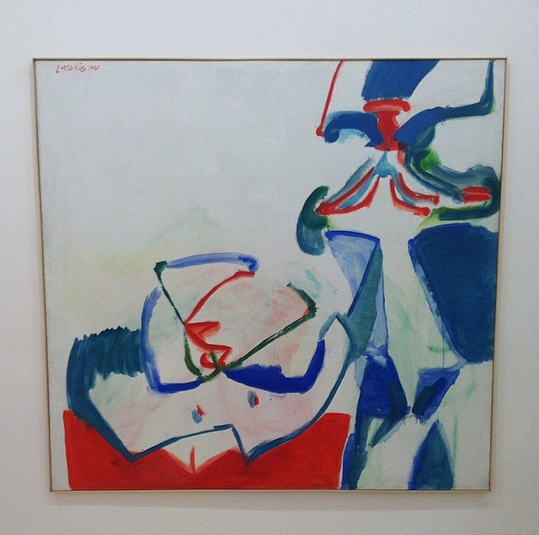 Alongside these works, PS1 is also showing a series of the artist’s earlier, more abstract compositions, including a series of still life pieces and abstractions. 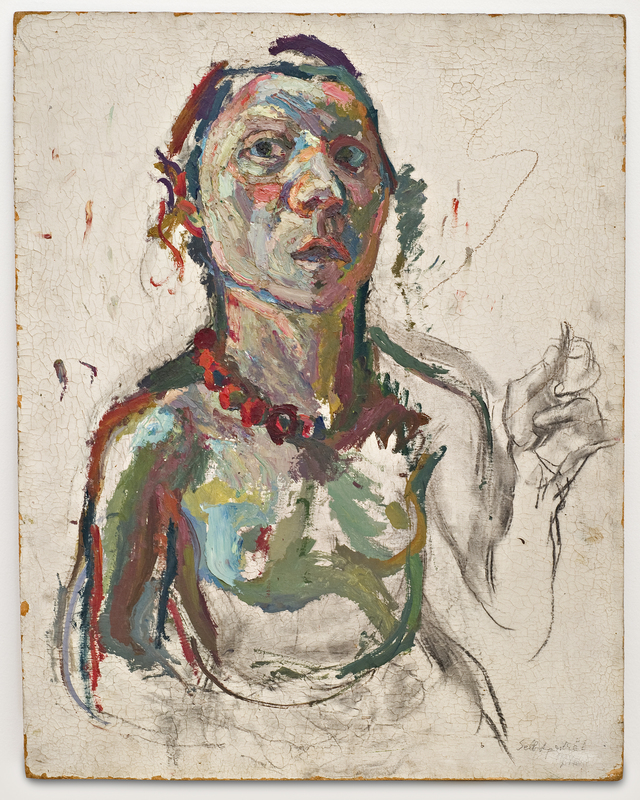 Throughout, the initial hints of Lassnig’s striking style can be detected, a blend of her sharp, quick line work and delicate blending of multiple colors to create the depth and energy of her works. The gallery is also showing some of the artist’s video pieces, including an intriguing, collaged work telling the story of Lassnig’s artistic aspirations, education and work, all sung by the artist and accompanied by her own drawings. Lassnig is unafraid of wearing many hats, and PS1 does a fine job of accommodating her many interests and investigations into the painted canvas, and other media formats over her nearly 70 year artistic career. 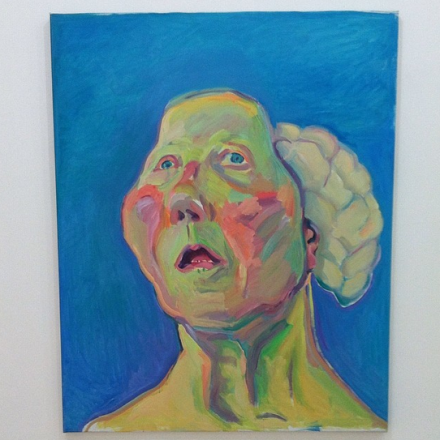 But perhaps the most notable part of the show is Lassnig’s approach towards her own mythology. Using her own life and body to continually break down, reshape and build up her creative mystique, Lassnig’s body takes on a fascinating centerpiece here, both as a mode of expression, and the ultimate manifestation of her own approach to her work, its reception, and ultimately, its preservation. 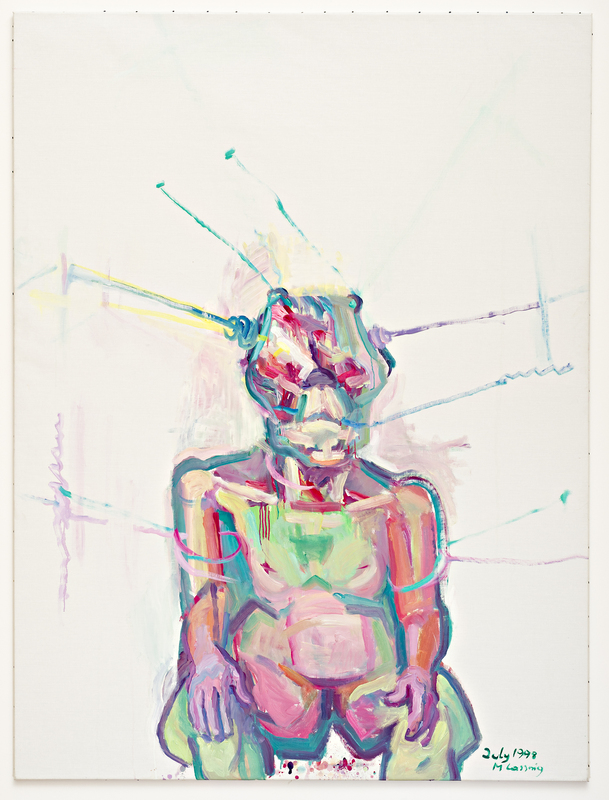 Lassnig’s retrospective is on view through May 25th. 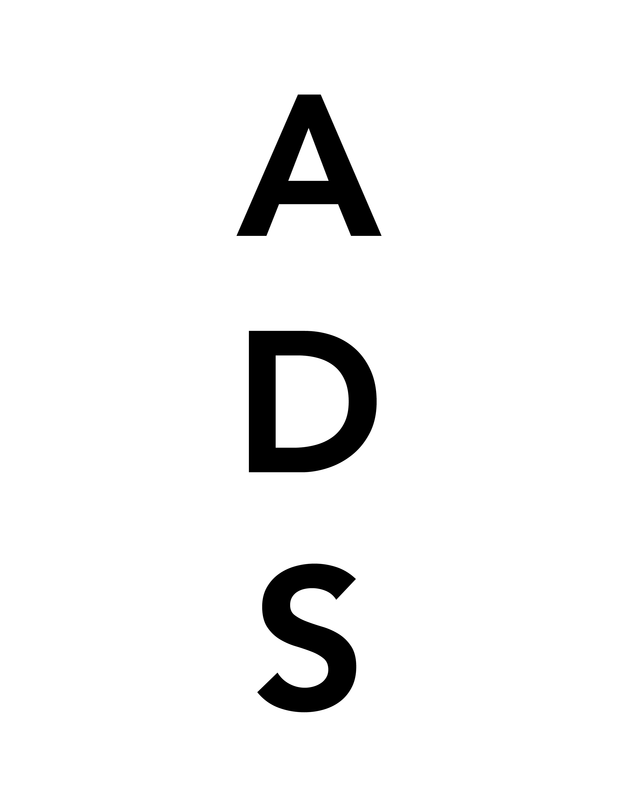 This entry was posted on Monday, March 31st, 2014 at 12:00 am	and is filed under Art News. You can follow any responses to this entry through the RSS 2.0 feed. You can leave a response, or trackback from your own site.